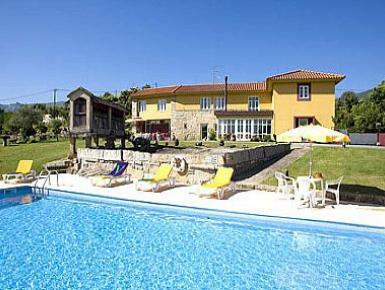 In an elevated position off a wooded country lane, this fine manor house enjoys a privileged location in the village of Gondomil, with the pretty garden town of Monção and the charming walled centre of Valença, two of the regions treasures, both a mere 8 km away, whilst the nearby sea can be reached in a 20 minute drive. With the towns of Valença and Monçao close to hand, a short drive will take you to a wide range of shops and restaurants, although some 800 m from the house is a small shop that sells basic items and a coffee shop. Nearest restaurant is 2 km distant, and one finds a riding centre only 1 km from property. Being close to the Spanish border, the sandy beaches of the chic coastal resort of Baiona are 17 km from the property and are thus an attractive option for a day trip. On the Portuguese side, the beaches of Camarido (20 km) and Moledo do Minho (23 km) are most inviting during the summer season. It is 100 km to Porto, with its international airport, and only 30 km to Vigo (Spain), also with an international airport..